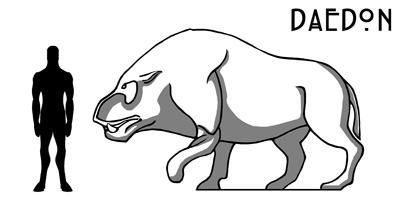 The Daedon are enormous herd porcines with broad, flat, warthog-like faces complete with ‘warts’ (fleshy wattles supported by bone). They closely resembles their more mundane and manageable pig cousins, but are exponentially larger and more lethal. Daedon grow up to 3.5 meters long, 2.2 meters tall and can weigh up to a tonne. Variant Daedon herds can be found across Aeldos, migrating across open plains and forests, browsing, grazing and often overgrazing their habitats. The species makes up a key part of many apex predator diets and while they can live up to 35 years few live past 15 in the wild. Daedon are slow-witted and resilient herbivores that can be found across the continent. The approach of a herd is typically heralded by the thunderous sound and rising clouds of dust churned up by their immense hooves. They are rarely seen outside of a herds of 25-40 and pose an immediate danger primarily by virtue of their weight and tendency towards dull witted panic. The species is poorly received by local farmers due to their propensity to reduce farmlands to dust, but are often welcomed by hunters who can derive a years worth of meat from a single harvest. Daedon also possess incredibly thick hides that are used in clothing and simple armour. With the exception of rutting males, Daedon are generally placid until threatened and rarely attack individually. Instead the danger they pose comes from their tendency to stampede in massive herds, crushing any unfortunate creature between them and escape. This is exacerbated by the species sharp lower incisors which are used to gore targets or threats. Some ambitious Ossandrians and Victrans claim they have succeeded in ‘taming’ small groups or individual Daedons, using them for the harvest of milk or meat. Such domestication is typically achieved by harvesting herds and capturing newborns. The species is famously slow-witted and impulsive though so it is enormously difficult to construct an enclosure that can survive their casual disregard and constant hunger. Lesser Pigs are found throughout Aeldos, often in proximity to Daedon herds. Attempts to cross-breed the two species rarely produce anything but misery. Plains Daedon: The most populous branch of the Daedon family is found in the plains of Lux and Ossandria. These are the proto-typical Daedon described above. Northern Daedon: A more heavily furred, slightly smaller sub-species found in Svertheim, Granden, and Vandar, the Northern Daedon gathers in smaller herds of 15-20 and tends to inhabit the forests, avoiding the frigid chill of the northern plains. Mire Daedon: A much less herd oriented variant found in the great mires, this sub-species is smarter, less panicky, and often has a greenish hue owing to the algae growing in their fur. Mire Daedon are particularly adept at finding nutritious fungus. Also known as “Swamp Pigs”.